Survival cement, also known as “cob”, is a combination of grass and mud. Throughout history, this mixture has been used for a variety of projects including to build shelters, outdoor kilns, and ovens, etc. If done properly and designed well, structures made from survival cement can last a very long time. In fact, the Anasazi ruins, in Utah, were built from cob or survival cement and they were several thousands of years old. It’s also used in a looser mixture as a mortar to hold other building materials together. There may come a time during a survival or extended bug out situation where knowing how to make survival cement will come in very handy. It could even mean the difference for your family in having a shelter and living continually exposed to the elements. 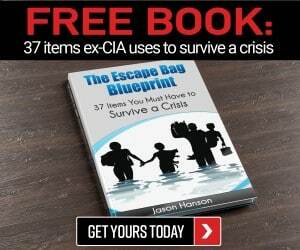 The best thing you can do in order to be prepared to survive in a bug out or extended SHTF situation is to practice the skills that you know might come in handy to your survival. One of the basic human needs when you are in a bug out situation or SHTF situation is a shelter. 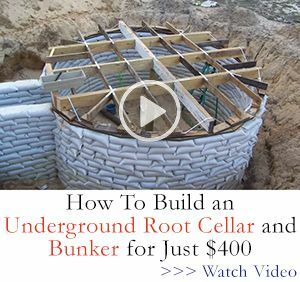 Now if you are trapped overnight in the woods, the time and energy it takes to build a shelter out of survival cement or cob just isn’t feasible. But if you find yourself stranded in the middle of the woods in September without a permanent shelter and you are certain your family might be stuck there through the winter months then you may want to consider a shelter made from survival cement. It will withstand the elements over a long period of time, you can build it with minimal heavy lifting and without having to cut or haul logs. Now perhaps you’re thinking, hey I’m smart, my bug out location has a cabin or even a house. I’m all set. And maybe things will go just as you planned. But in a grid-down situation, how will you bake and cook? An outdoor cob brick oven will come in handy because it’s easier and more convenient than cooking over an open fire daily. How about a kiln to build a larger stock of plates, cups, and containers that you need in the coming months? A structure that will provide shade and shelter for your chickens or that cow that wandered onto the property last month might come in handy. If you don’t have building materials before SHTF, you won’t find them afterward unless you spend ample time in the woods, cutting, felling, and hauling trees to use for wood. While most types of clay will work, you do want to try to get dirt or mud with more of a clay composition than sand or soil. The best place to find this type of mud or clay is along the edge or bottom of a stream or pond. Clay is often found on the bank of rivers or any other location where the top layers of soil may have been stripped away. If you must, you can dig down through the topsoil yourself to locate clay. Dry clay will have a chunkier or crumbled appearance and it may even appear to be small rocks. When clay is wet it looks and acts a lot like mud. Once you find some clay, test it by wetting it slightly and rolling it into a ball in the palm of your hands. If it sticks together and remains in a ball, it’s clay. Once the clay holds its shape, put a large amount into a bucket or other container and add some water. The best thing to use in your survival cement mixture is dry pieces of grass or straw. The correct length is determined by the project that you are attempting. Typically, bigger projects such as a shelter or kiln, require grass pieces that are 8-12 inches long. It’s best to position the grasses so they will run lengthwise through your mixture, to provide additional support to the piece or structure. Lay out a tarp on the ground and dump the wet clay onto it. You should have added enough water and mixed it so that it’s a sloppy but not too runny. It should still hold its shape if you roll it into a ball. You can mix the clay with your bare feet or you can fold the tarp over the mound and step on the tarp to mix it. Keep mixing and folding the large mass over and over until the grass is thoroughly mixed into the clay. Once the clay and grass or straw are mixed together thoroughly, you need to form your survival cement into “bricks”. These can really be any kind of shape but are usually square or rectangular. Some people prefer to use a ladder like a frame made of wood to form the survival cement into similar shapes. Each clay brick should be about half grass and half clay. Clay will begin to dry and firm up quickly so make sure you shape your bricks while they are still wet. Use the dried blocks to build your structure. This can be anything from a fire pit to a kiln, an outdoor oven, the frame for a bed, a shed, barn, or even a house. Use a much sloppier, looser mixture of clay, without the grass mixed into it as a mortar to glue the cob bricks together. It’s best to have your structure designed and even drawn out or laid out in the dirt before you get started because clay dries very quickly in the heat of the sun. Survival Cement can also be used for repairs when modern cement is unavailable. Survival cement used as mortar should be thinned out with water to a thinner consistency. It can be used to patch holes in walls, driveways, etc. It can also be used as a mortar to seal other building materials and make them water resistant and stronger. In fact, if you must build a shelter quickly from logs and branches, you could use some survival cement to fill in the cracks and make it more water resistant and draft-free. Remove all rocks, sticks, and organic matter from your clay mixture before getting started. Pay attention as you work with the soil and adjust your ratio of clay to straw/grass accordingly. Once your survival cement bricks are shaped, use them as soon as possible to prevent setting up. If your bricks set up, you can add water very gradually to make them flexible again. Some people have added sand to the clay and straw when making survival cement. 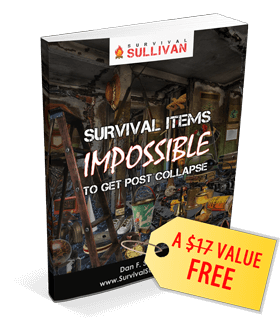 In a grid-down or survival situation, you will not have the luxury of a trial and error learning process when it comes to building with survival cement or cob. The best thing you can to do to be prepared for whatever situation you find yourself in is to learn and practice making and building things from survival cement in advance. The Hand-Sculpted House: A Practical and Philosophical Guide Building a Cob Cottage $25.17 for kindle edition or $26.49 Paperback. This book includes so much more than how to build with survival cement. It also includes checklists for choosing the right piece of land and selecting your building site. It provides a tutorial in how to heat your home with passive heat. There are tips on interior design, including how to mold stoves and benches from survival cement. You’ll find tips on mixing, building, and finishing techniques, and more. Building with Cob: A Step-by-Step Guide Kindle price is $18.49 and the paperback is $31.65. This book includes detailed instructions, complete with photos, for building a home from cob (survival cement). You will find info about finishes made of natural materials including earthen plaster and homemade clay. Construction details for how to build a structure from survival cement (cob) that is building code compliant are included. The Cob Builders Handbook: You can Hand-Sculpt Your Own Home Priced at $20.35 for Kindle version. Here you will find details on how to mold your own structure from survival cement. The book includes sections about how to design your cob home and all its elements from the floor to the windows and ceiling. So, if a natural disaster takes down your home and you can’t afford to pay someone to rebuild it for you or when SHTF and your bug out location becomes your new permanent home, keep survival cement in mind. With proper planning and knowledge, it is possible to use survival cement for survival to build, repair, and create the things that you and your family will need.